Simple and cocoon? Our Standard rooms! All our Standard rooms (22 sqm) are equipped with quality bedding of dimension 160x200cm, carpeting, air conditioning with individual control, a wardrobe, a luggage space, a working desk (including a comfortable chair, telephone, wired internet access), free and secure connection to the wireless network Wi-Fi, 42″ LED multimedia TV (Smart TV’s) with a wide range of channels, a table and an individual & design shower room (including washbasin, WC, walk-in shower, hairdryer, cosmetic mirror and welcome products). Standard Room occupancy: max. 2 persons. All our rooms are 100% non smoking. Do you need more place ? 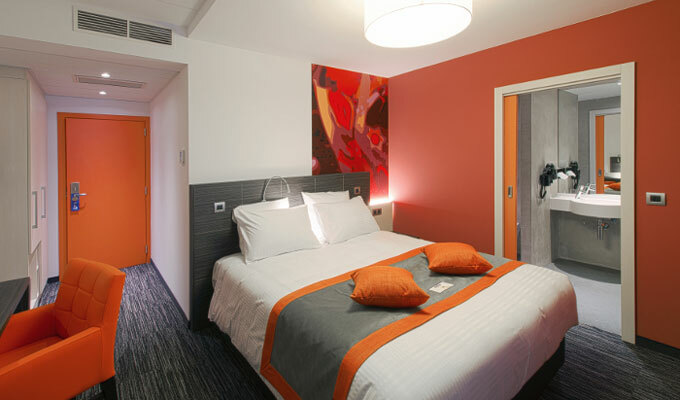 Take a look at our Executive and Suite rooms. For hygiene issues, your pets are not allowed in this kind of room type. Travelling with a group? We can study your request from 8 rooms with specific rates and conditions. Contact us!